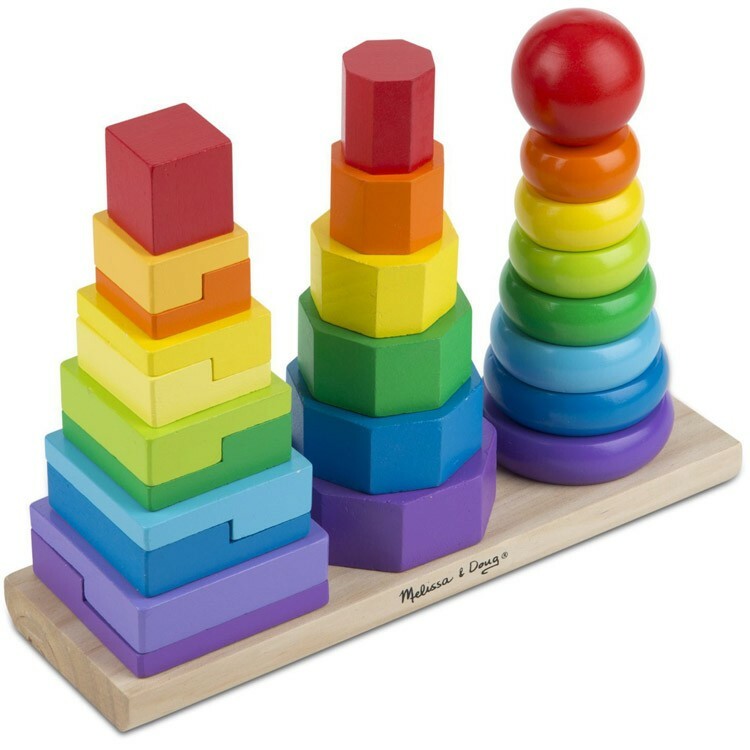 This colorful kids stacking toy from Melissa & Doug includes 25 wood pieces stackable in different ways, providing hours of entertainment and delightful learning for your child. 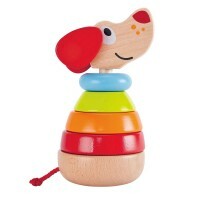 Dazzle your child with our Geometric Stacker Wooden Stacking Toy. 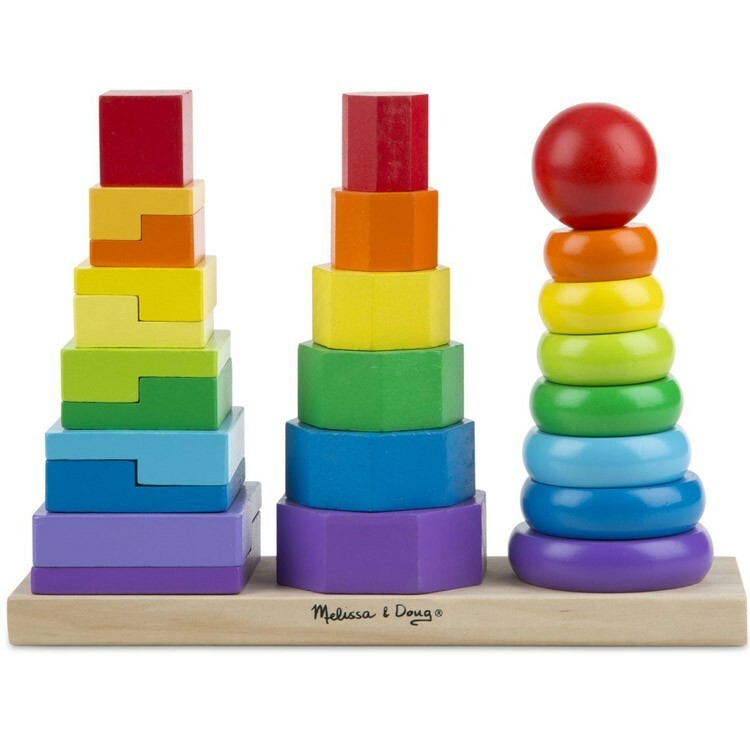 This colorful kids stacking toy includes 25 wood pieces stackable in different ways, providing hours of entertainment and delightful learning for your child. 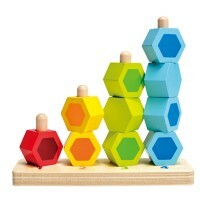 The Geometric Stacker Wooden Stacking Toy adjusts to your child's expanding development. 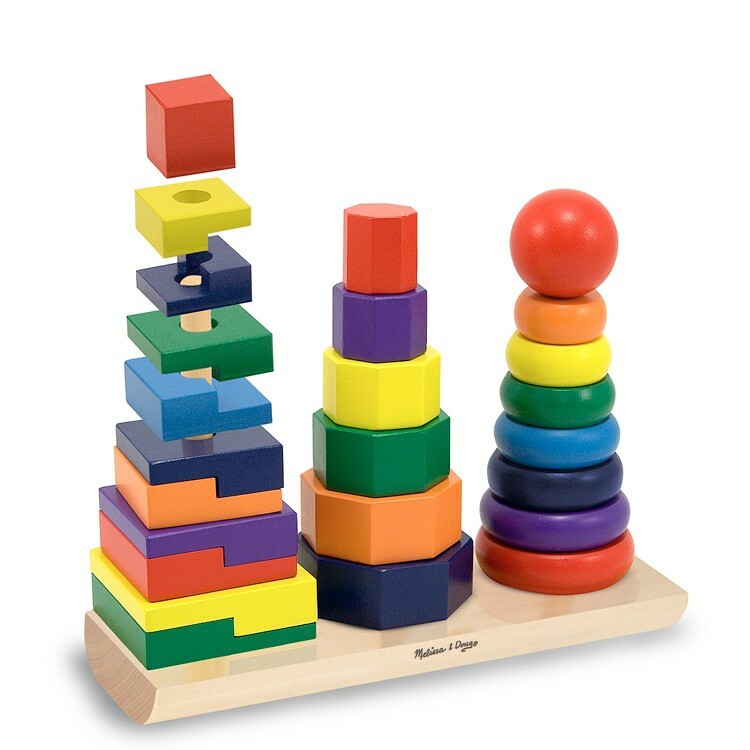 At first, it can be used for simple entertainment; however, math concepts, creativity, shapes, problem solving, sequencing, and colors are only a few of the skills instinctively enhanced by this masterful toddler stacking toy. 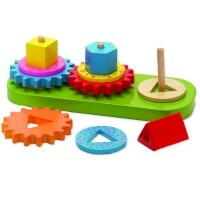 With wooden shapes (such as rings, squares and octagons) painted in bright colors, your child will stay entertained as they experiment with different stacking combinations. 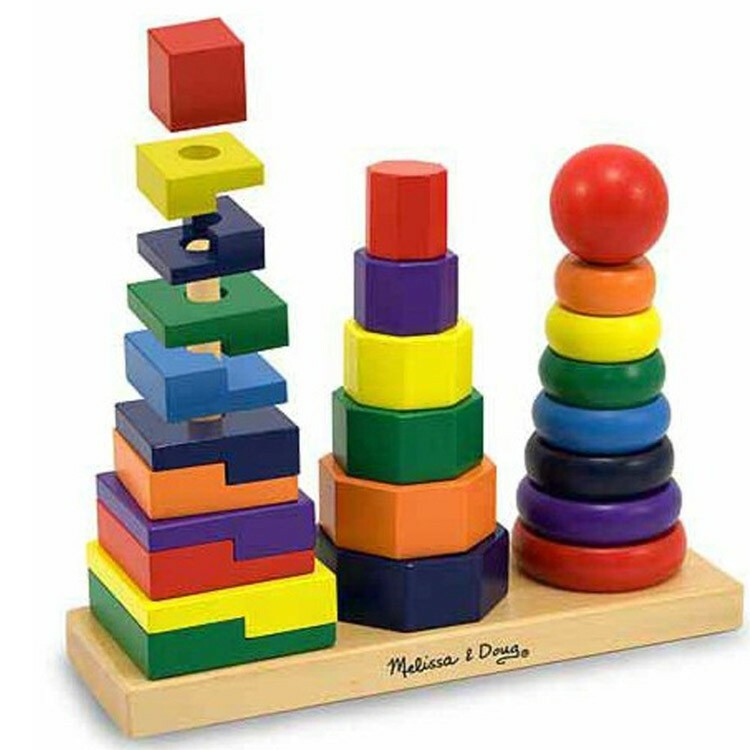 The base includes three wooden poles for stacking, but the blocks can also be used independently, away from the base. 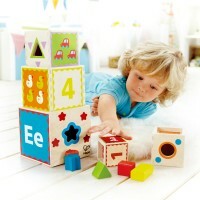 And there's added benefit for Mom: building vibrant block towers keeps your child amused while the brain benefits! 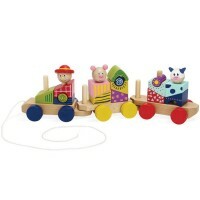 Why invest in toys that eat batteries and don't enhance your child's creativity and development? 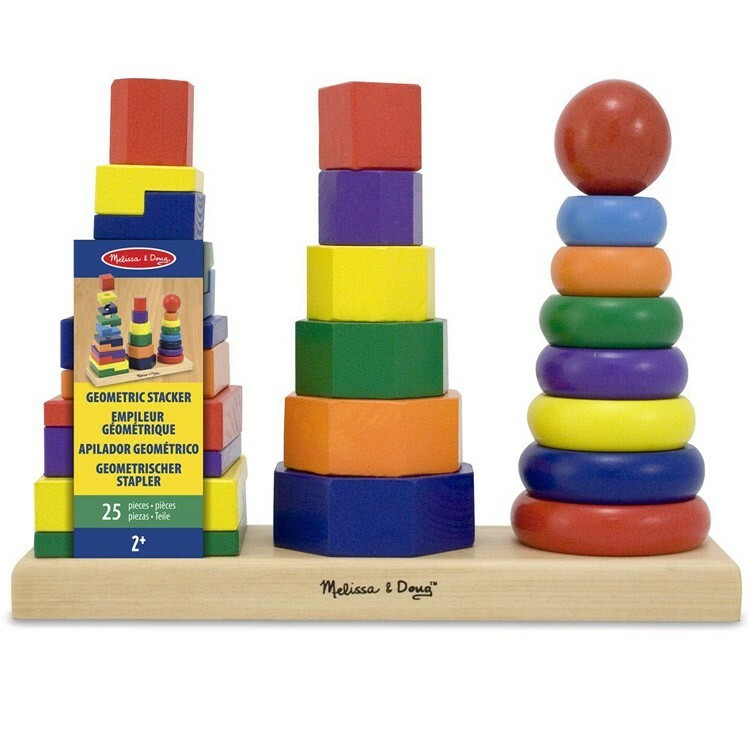 If you're looking for a great stacking toy, skip the basic plastic ring stacker and reach for the Geometric Stacker Wooden Stacking Toy from Educational Toys Planet. 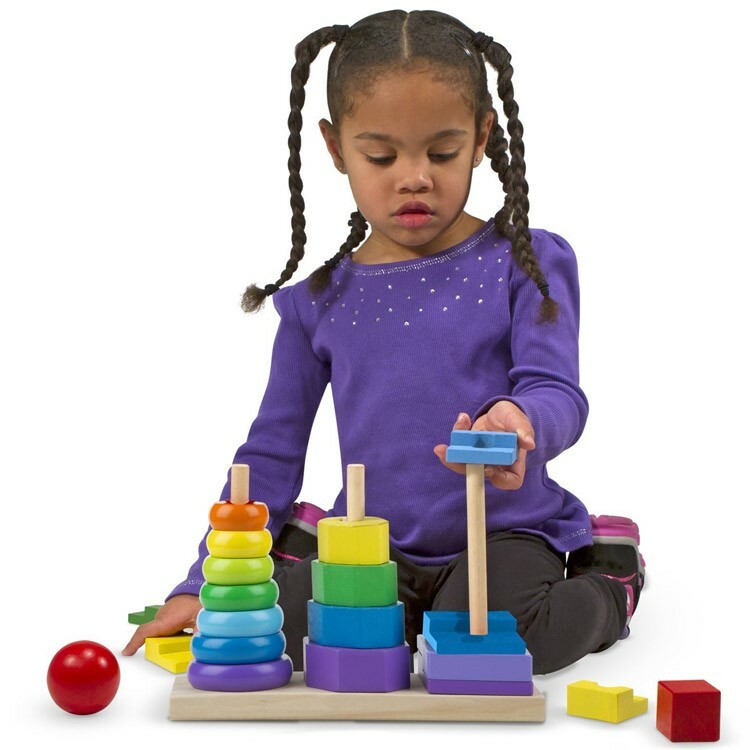 You'll get three times the play, three times the learning, and it's big enough to allow more than one child to use it at a time. 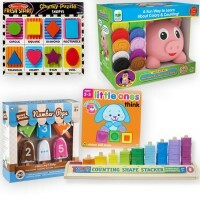 As a Melissa & Doug product, Geometric Stacker exceeds all company and US toy testing standards. 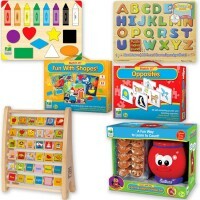 Dimensions of package 3.5" x 8.5" x 11"
Write your own review of Geometric Stacker Wooden Stacking Toy. Rating: 5 by Tiffany, CA My son plays with this pyramid of shapes for hours. Thank you! 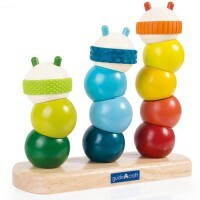 Rating: 5 by Jean, NJ Definetely one of the best educational toys on the market. Absolute must to learn shapes and patterns. Simple and fun. 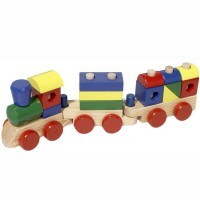 Rating: 5 by MaryKatherine, OH Twin two year old grandsons love this! They play with it for hours. They are inventive! 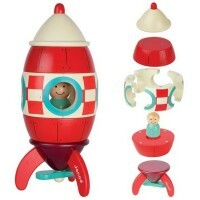 Rating: 3 by Kristie, SC To many pieces for a small toy, lots to learn but 18 mo. old and 3 year get frustrated with it. Rating: 5 by Efstratios, ON High quality design.